Little Stars provide pre-school and after school services in PETNS. “Tyrrelstown’s Little Stars childcare provides high quality, flexible and affordable childcare that meets the needs of parents and children alike. We know how precious your little ones are. That’s why we work hard to provide the highest quality environment in our crèche. Fun, safety and care are our golden rules and our crèche is HSE registered so you can be sure we maintain suitable child/carer ratios. Catering for children aged 1-6 years, we guarantee a splendid time for your child. There’s loads of toys to keep all ages amused and occupied, and activities such as soft play and creative arts. All members of the Tyrrelstown’s Little Stars team are registered and verified and work to preset Policies and Procedures, which ensures professionalism at all times. 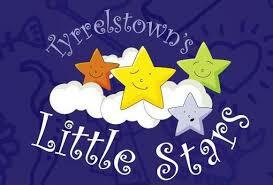 Regular training is given to all team members at Tyrrelstown’s Little Stars.